My first memory of seco de chivo or Ecuadorian goat stew is when I was very young (maybe 5 or 6). We went to a nearby village for their fiestas or annual festivities. Everyone was talking about how this town had some of the best seco de chivo in the area and they only prepared it during their fiestas. There are several versions of seco de chivo, most of the ingredients are very similar, but one of the variants is the type of drink or beverage used to prepare the stew. I’ve had it prepared with chicha, an Andean fermented corn drink, as well as with beer, which is more common now because it is easier to find beer than chicha. Another option is fruit juice, specifically a fruit called naranjilla (also known as lulo in Colombia), which is a very tart fruit that can be found mainly in Ecuador and Colombia. The taste of the goat stew will vary based on which drink you use, in my opinion they all taste great, but there are people that have very strong preferences on how they like their seco de chivo prepared, the most traditional preparation is using chicha. Ecuadorian seco de chivo is a goat stew dish braised in a sauce of garlic, cumin, achiote, oregano, peppers, onions, cilantro, tomatoes, chicha or fermented corn drink, naranjilla or lulo juice, panela and spices. Season the goat meat with garlic, cumin, oregano, salt and 1 cup of chicha or beer, let marinate for at least an hour. Remove the meat from the marinade and save the marinade juice for later. Heat the oil over high temperature in a large sauté pan and fry the meat until browned on each side. Lower the heat to medium and add the minced onions, achiote and minced bell peppers, cook until the onions are soft, about 5 minutes. Meanwhile blend the tomatoes, cilantro and hot peppers with the remaining cup of chicha and the naranjillas or naranjilla juice, strain and add the strained puree to the meat. Add the saved marinade juices, the grated panela and all spice, bring to boil, lower the temperature and simmer until the meat is very tender and the sauce is thickened, about 2 -2 ½ hours. Taste and add salt if needed, sprinkle with chopped cilantro and serve warm. 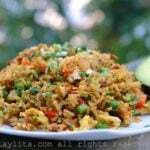 Serve with arroz amarillo or yellow rice, fried ripe plantains and avocado slices. Some alternatives to naranjilla juice (in case you can’t find it), include passion fruit concentrate (or juice, but omit the panela if the juice is sweet), tamarind juice or paste diluted in water, or even just a mix of fresh orange juice and lemon juice. Originally when I was planning this recipe I was going to make either with beer or naranjilla juice because I knew I could find frozen naranjilla pulp and even frozen naranjilla fruits. However, to my surprise I actually found chicha when I went to the Latin grocery store, it does come from Peru so it is slightly different than the Ecuadorian chicha, but it is close enough. So this time I am preparing the seco de chivo with chicha – you can replace the chicha with beer as the quickest option. I’ve also found that a combination of beer, white wine and a bit of orange juice work well as a chicha replacement option. Chicha is also very similar to cider, so a fruity semi-dry cider could also be used. Another ingredient used to make this dish is called panela or piloncillo; it is hard brown sugar and comes in a brick shape (though I’ve also seen it in cone shape). Panela is made directly from sugar cane juice, in Ecuador it is made in trapiches, which is a very rustic processing area, we had a few close to our farm and we had a small field of sugar cane and when they were ready to harvest the canes are cut with machetes (the bases are left and grow back), then the sugar cane is loaded unto donkeys (which are wearing these special wood devices to carry the sugar cane), next the sugar cane is taken to the nearest trapiche, where it first goes through a press that squeezes the juice out. The juice, which is called guarapo and is delicious mixed with bitter orange juice, is then cooked in these large rectangular metal devices (that have fires going underneath) and stirred with these huge wooden spoons (that almost look like kayaking paddles), it goes through several different of these cooking stages until at the end you have a very thick syrup, which is then poured into small brick shape wood molds, once the panela dries it hardens and the molds are removed. It is a very interesting process and just the trapiche part takes about an entire day, and of course as a kid you get to drink some guarapo and taste the cane juice syrup. In Ecuador we use panela as most people would use sugar: to sweeten coffee, tea, juice, to bake and to make marmalades or fruit preserves; the panelas are kept in their hard brick form until ready to use and then they are melted down with water to make a syrup called miel de panela (panela honey) which is used to sweeten things, or it is also grated when used in certain dishes or for baking. Panela can be found in most Latin grocery stores or even in certain mainstream grocery stores. Enough about panela, another interesting thing about seco de chivo and goat meat in general is that when it is prepared the correct way it should not have a goaty flavor (which you usually find in goat cheese) and it should also be very tender, which is why it is braised or cooked very slowly over low heat. Seco de chivo is served with arroz amarillo (rice cooked with a little bit a achiote or annatto powder to give a yellow color), fried ripe plantains and avocado slices. Laylita! I am Ecuadorian American and I have learned so much about ecuadorian cuisine from your blog! Hola Laylita! Muchas gracias por recetas tradicionales! Ok but really thank you! I am planning a surprise birthday party for my Ecuadorian husband who has NEVER had a birthday party and am going to be utilizing a lot of your recipes, including the seco de chivo as we raise our own goats. My question for you is, what would be the best items to cook for a large group of people? So far I have the seco de chivo and the arroz amarillo but need a few more sides. Thanks! 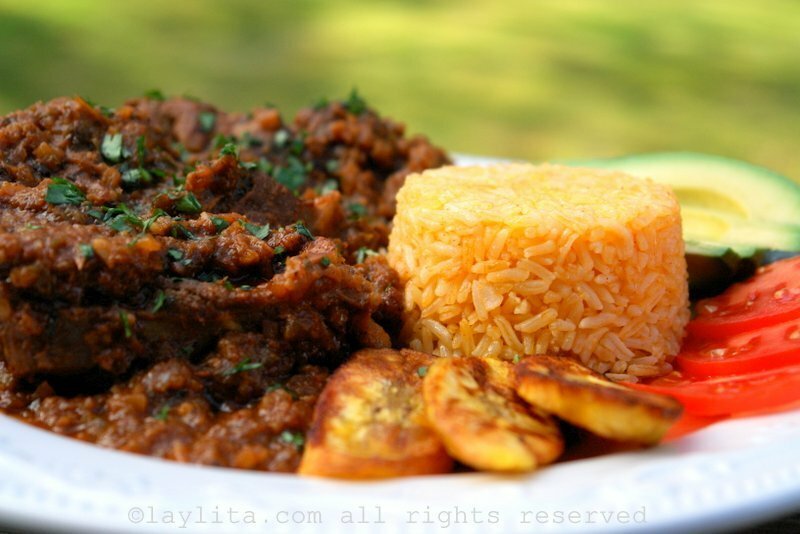 Hi Melanie – Some fried ripe platanos are a must, as well as the tomato onion curtido. Ensalada rusa potato salad is a great side dish for parties and can be made ahead. If you have time you can also make some shrimp ceviche (more as an appetizer), which can also be made ahead. I’m Puertorican and Cuban and my husband is from Ecuador. His mother is from Loja, but he grew up in the Costal Regions of Ecuador. I can’t thank you enough for your website. I have made several of your recipes and have blown my husband away. I LOVE Seco de Chivo and I will definitely be making it this weekend. Keep those wonderful recipes coming our way! Con mucha admiracion, Taina from Chicago IL. Your Seco de chivo recipe sounds just like the one that I sampled and loved at a home dinner in Ecuador. How many does it serve? I wish to make it for my gourmet dinner group and would need to increase the recipe to serve eight. Hi Rosa – This will serve 4 people. For 8 people, I would recommend doubling the amount of meat, but only adding 1/2 extra of the marinade ingredients. Laylita un millon de gracias por sus recetas tan ricas – Soy cubana casada con ecuatoriano y no sabes cuan importantes son tus recetas, pues nos ensenas como hacerlas aqui en los EEUU. Haha so here is where my wife found the seco de chivo recipe, she is from Colombia and we had seco de chivo in our last visit to ecuador. She knows I love it. Last week she surprised me cooking seco de chivo here in the US, I thought she called Ecuador and got the recipe from my family or some thing. Today I stumbled across a print out of the seco de chivo recipe from laylita.com. Now I know. I was really speechless when my wife show me this dish. 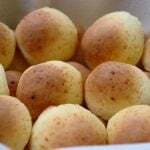 Then in every bite, I sank into memories of my childhood, specially when it rained, that sweet smell of wet grass/earth got mixed with aromas from my mothers kitchen. At the table my father would complement her cooking and my brothers and me would eco that complement. I must have been gone for a while or my ayes starting to get wet, that I did not notice my wife was standing next to me, rubbing my back telling me it is oK honey. Then I complement her cooking. Hi i am mexican and my wife is ecuadorian and let me tell you something this seco de chivo is one of my favorites it is delicious!!!! i use a pressure cook so the time is reduced to a an hour,i use corona beer and naranjilla, all the ecuadorian food is great. Why do you insist on torturing me with all these great dishes? I need to make this badly!!! Hi Laylita! Thanks for the recipe I can’t wait to try it. Instead of Panela, can I use sugar? Which would be better to use: Regular (white) sugar or Brown sugar? Hi Shadia – You can use sugar, brown sugar is best. My husband is fropm Ecuador and I have been trying some of your recipes and he loves them; we all love them. The next dish that I will be trying will be Seco De chivo. My question to you is how many servings does 2 pounds of meat give you for this dish? My other question would be as to where would i be able to purchase the chicha. Thank You. Hi Susana – You should get 4 big servings or 6 smaller servings with 2 lbs of meat. I found the chicha at the Latin grocery store. Fantastic!! Thank you for your suggestions. I love your website, it is not only helpful but also informative and easy to follow recipes. Love it. I intend to make this meal for my brother’s birthday this Sunday. I will let you know how it went. Thank you again. If you were making seco de chivo as your main dish what would you accompany it with? Soup or salad or a seafood side dish. I would really appreciate your help. Hi Veronica – For seco de chivo you should definitely have some rice and a salad (it can be a regular salad or a decomposed salad – avocado slices, tomato slices, curtido or pickled red onions). Other side dishes for seco de chivo include fried ripe plantains, boiled or fried yuca, mote or hominy is another good side dish. If you’re looking for something that you could serve as a first course before the seco de chivo you could serve a soup (a really easy to make soup is locro de papas) or you could also serve shrimp ceviche as a starter – it’s tasty and light. Hope this helps! This is the best recipe site I ever found! My wife is from Ecuador and I have been made 3 dishes from your recipes already. She was shocked on how good they were. Where can I find the panela or piloncillo? I want to make this recipe but the supermarket does not have if. Hi Frank – If you have a Latin or Mexican grocery store nearby it is the best option for panela, I’ve also found quite a few Latin American ingredients in Asian supermarkets (but I don’t recall seeing panela), last resort if you can’t find it is to use brown sugar. Hi, I’m from Ecuador but living in California for many years. I’m learning how to cook ecuadorian dishes and I find this page very interesting. I have a question about preparing ceviche ecuadorian style. In Ecuador we use corvina fish for ceviche, what’s is the equivalent for that fish here in the US (so. California is where I live). I appreciate any useful information on this. And congratulations for the recipes and pictures. Hi Roberto – Corvina is a type of sea bass so you can use Chilean sea bass or halibut (also a type of sea bass) to make good ceviche. At least here in the NW halibut is readily available and fresher than Chilean sea bass. This looks amazing – the only problem for me is that I can’t get hold of any goat meat (I tried my two local butchers to no avail). If you were to replace the meat, what would you use? Beef? I love the site – Ecuador is an amazing country, I was only there visiting for a couple of days but totally fell in love with the place. The food there was amazing. Hi Andy – Thanks for the comments, you can replace the goat meat with lamb. Hi Jeannine, in Ecuador a pilsner or lager beer is the most commonly used for cooking (and drinking), I haven’t ever tried making seco de chivo with Guinness, it actually sounds very interesting, my only concern is that the flavor of the Guinness might be too overbearing for the goat. Let me know how it goes. Thank you, Vicki. I would substitute either with passion fruit juice or orange juice, but probably not lime juice. Hi Layla – This looks delicious, as does everything else on your blog. Do you think I could substitute a mix of lime and orange juice for the naranjilla? I made this recipe exactly as you wrote it, Laylita, and it is the most delicious seco I have ever had. What is it that makes chivo so flavorful? Thanks so much for this and all your awesome Ecuadorian recipes!